I did this for a friend's birthday - Something personalised says more than any amount of money (that's my story and I'm sticking to it! LOL). 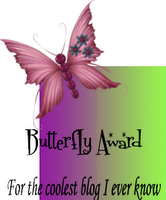 I wanted it to be something special and I was really happy with how it turned out. Stampin' Up products used are the Spring Bouquet Flower punch, Spring Flowers Designer Series paper and background stamp from Looks Like Spring stamp set. 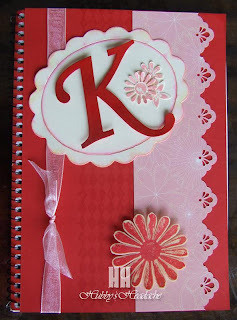 For the "K" I printed an outline onto red cardstock, cut it out, then embossed it. It's also raised up on dimensionals. Wow!!! Deb this is just so pretty!!! I bet whoever you gave it to LOVED it!! This is so striking Deb. Love those colours together - is it a little notebook. The monogram idea is great - makes it truly personalised! WOW, Stunning, love the colours and the monogram!